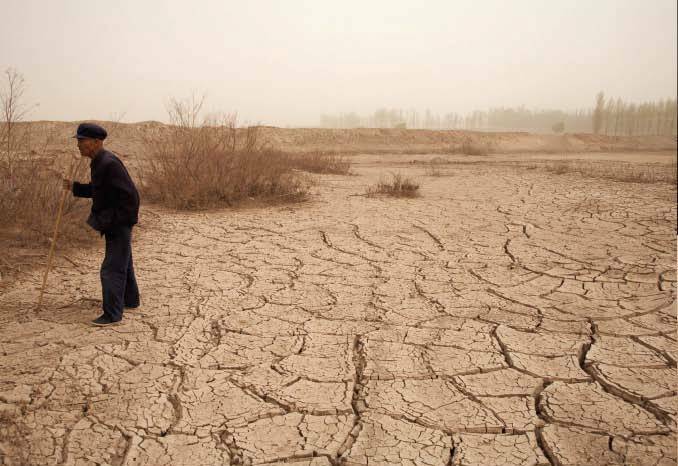 Desertification in China. Image by Benoit Aquin. 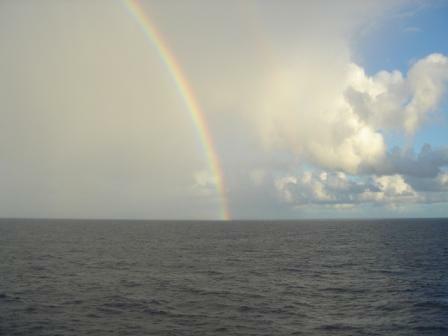 Today, some additional facts about water, or its absence. As an opening frame of reference, it takes 150 gallons of water to make a loaf of our daily bread. The North China Plain is a desert, some of which is natural but much of which is man made. Herders and farmers in this region have managed to turn more than 110,000 square kilometers here into desert since 1950. 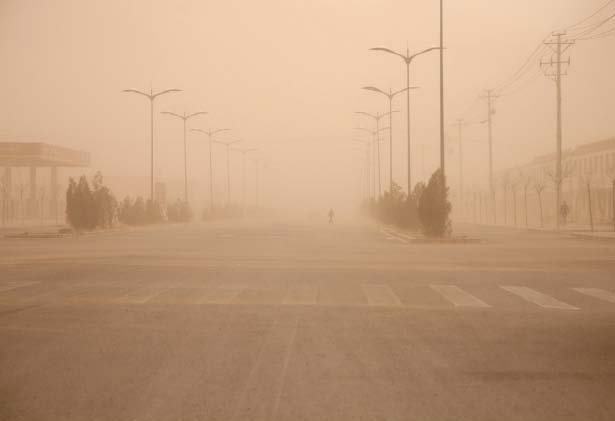 During one dust storm in 2006 (there were 17 that year) 300,000 tons of dust were deposited in Beijing in one night. Often the dust from this desert reaches the west coast of North America. Beneath the North China Plain is a shallow aquifer. The water there is more than 1,000 feet deep, and it’s sufficiently depleted that irrigation is no longer economically viable for agriculture. 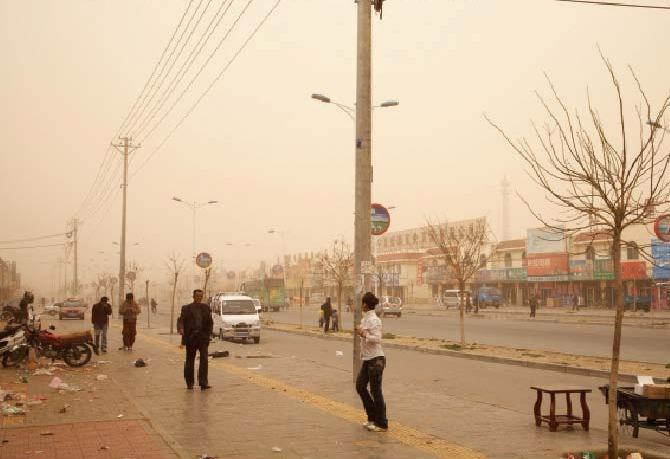 A dust storm in China. Image by Benoit Aquin. Nearer to Beijing, wells are often drilled more than half a mile to find water. Water use there is expected to surge 30% this summer because of the Olympics. As a result, farmers in the region have been instructed to grow corn rather than rice – corn requires less water. In China’s Qinhai Province there were once 4,077 lakes. In the last 20 years, more than 2,000 have disappeared. In Hebei Province, surrounding Beijing, 969 of the regions 1,052 lakes are now gone. 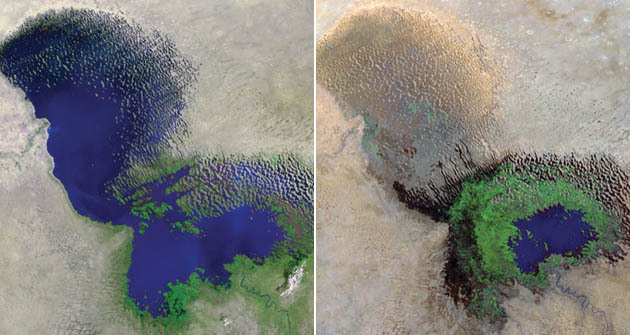 And in Africa, Lake Chad, once a landmark for astronauts in space, is just about gone. Lake Chad, in 1972, and 15 years later in 1987. Almost gone. And the water situation is even worse in India. Here ends today’s lesson. Dust, China. Image by Benoit Aquin. Footnote: Go out and buy this book immediately: “Plan B 3.0, Mobilizing to Save Civilization,” by Dr. Lester Brown, published by Norton Press. It will scare the daylights out of you, but it offers some hope. Gasoline in our region is running about $4.25/gallon at the moment. Every day the Post is filled with stories about rising oil prices and the resulting affect on all kinds of things: food; UPS and FedEx and the shipping business; the hospitality industry and dwindling numbers of travelers; the failing airlines; and a million other twitches. The notion that we have reached peak oil production, that we must now conserve, buy smaller cars, use public transit, ride a bike to work – all of these are becoming widely understood as required changes to our lives. Economic pressures are seeing to that. Good. Really, really late, but good. As non-car people, we here root for rising prices every day, since apparently it is only this that spurs us to action. Wait until the price of gasoline doubles – this will force even more sweeping realizations, and I hope actions to change our lives, and our cities. 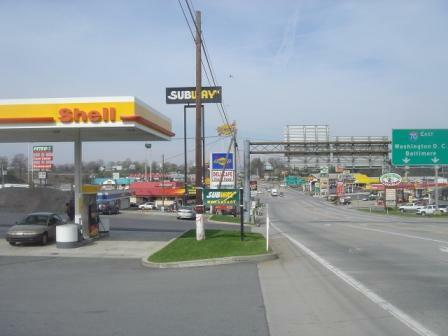 So as we think about the infrastructure we need in order to make these changes, rising gas prices suggest that we build many fewer roads, much less parking, much more transit, no more strip shopping centers. Much of this has been widely discussed here. But many scientists agree that there is one precious resource that will require even greater changes in our cities and our lives as it becomes more and more scarce, a resource that most of us take for granted, and waste, every day. Water. There are lots of technologies, lots of ways to conserve and recycle water, and more are being developed every day. So there are techniques, things that we can do in conserving water and treating waste, that could really help in agriculture (70% of world water usage), industry (20% of world water usage, and domestic consumption (10% of world water usage). The real question that has been bugging me is this: what will it take to get us to address water issues as we are just now beginning to seriously tackle oil issues? Would it help if your shower tomorrow morning cost $4.00 a gallon? 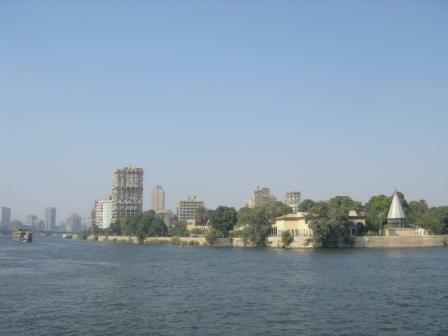 Would you want to find some of those conservation and treatment options right away, and revise the infrastructure of the next city? Seems like a sure thing. 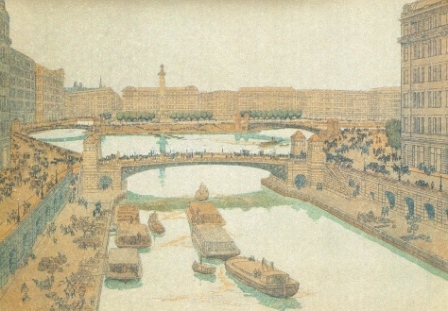 From the 1909 Plan of Chicago, a view by Jules Guerin. I really do want to get back to exploring some issues related to urban infrastructure and the next city, but I keep getting distracted by wacky news items. As most of you know, Chicago celebrates the centennial of the 1909 Plan of Chicago next year, and the City is planning a whole host of events, celebrations, conversations and exhibitions to mark the date, look back to a critical moment in the life of Chicago, and look forward to meeting the challenges the City faces in the future. I am worried that this will be more laudatory and celebratory than challenging, provocative or useful, but I am hopeful that some good things will happen. But less hopeful today than yesterday. This morning I learned that a cabal of Chicagons – many of them friends! – have decided to invite starchitects Zaha Hadid (London) and Ben van Berkel (Amsterdam) to design temporary pavilions in Millennium Park for the celebration. Now mind you, I’m not cranky that they did not invite Chicagoans, though I do recall much text in the 1909 Plan that talked about urban patriotism, which should have at least given them pause. But so be it. It’s a grand celebration. What bothers me is the fear that making a statement may well be more important to these Chicagoans than what gets said. They go and hire the flashiest celebrities they can find – will they get style or substance in return? In this age when personal expression seems to valued above any kind of civility, this could be dangerous stuff. I hope Chicago gets more for its money than the architectural equivalent of loud blabbering on some jerk’s cell phone: a lot of noise, and who cares, anyway? Steven Holl’s Linked Hybrid in Beijing. Image from flickr. Stephanie Busari of CNN in London wrote today to offer a link to the CNN International article she wrote about Beijing. Take a look. It’s nice to have been able to give her our perspective. After writing about the New York Times articles of June 8th in the last two posts, I was contacted by a young woman in London who writes for CNN. 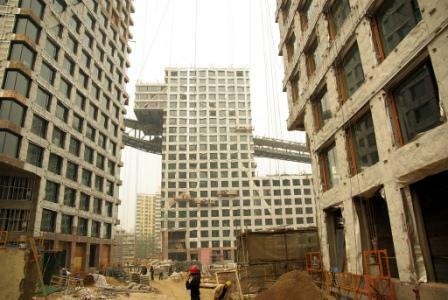 She is doing a piece on Steven Holl’s ‘Linked Hybrid’ (LH) development in Beijing, shown below. She wanted me to chat with her about the project. 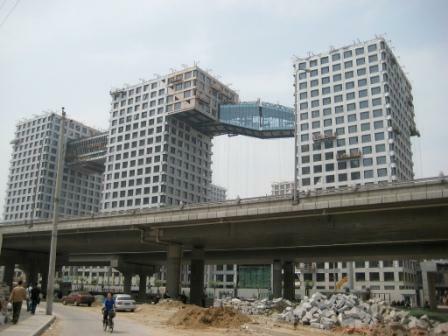 Steven Holl’s Linked Hybrid in construction, Beijing. Image from Google Earth. Greenwich Village. Image from Google Earth. Well said. Worth keeping in mind as Beijing, and all other next cities, unfold with breathtaking speed. Steven Holl’s ‘Linked Hybrid’ project, in Beijing, just 2.5 miles from the extraordinary Forbidden City. Image from flickr. 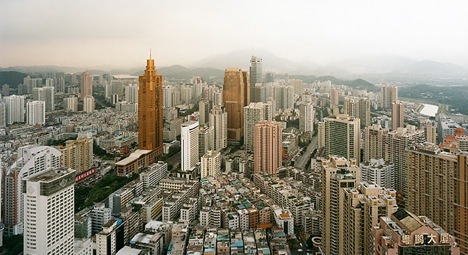 I continue to muse about the New York Times Magazine’s recent architecture issue entitled “The Next City.” In the feature piece, “The New, New City,” architecture critic Nicolai Ouroussoff talks about the dazzling speed and scale of redevelopment in places like Shenzhen or Beijing or Dubai, and suggests that building cities, big cities, from scratch in three or four decades, is without precedent. (What about my home town, Chicago, where the population increased more than tenfold in 40 years?). He suggests that the size and chaos of these places robs architects and urbanists of any intelligible starting point for designing the new. Well maybe, and maybe not. I will give Ouroussoff one point: contemporary development in Beijing and Shenzhen and Dubai is really awful. 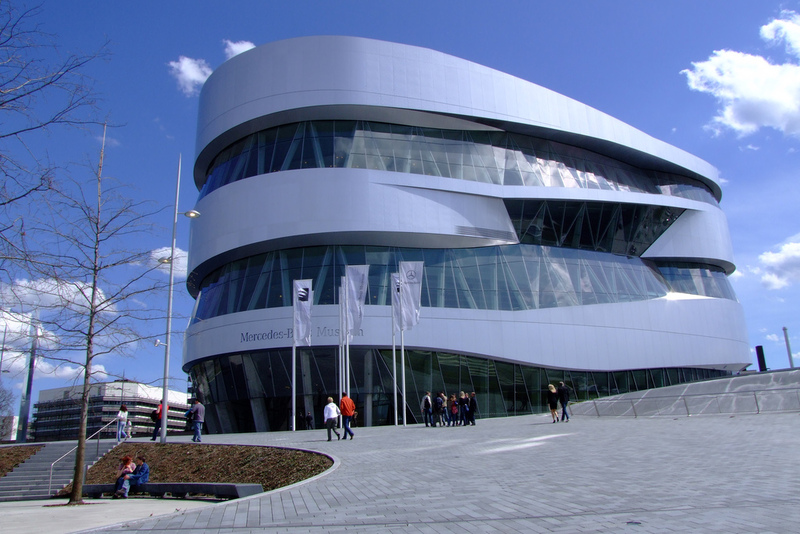 Unfortunately, some of the examples he touts as models for the future, as exceedingly ‘innovative,’ as benchmarks of new 21st century urbanism, are among the most significant failures. These cities are all becoming manic expressions of fundamentally defective ideas about how to make urbanism. Some are architectural petting zoos, some are designer-label crazy, some are crazy quilts of new construction, each walled and isolated from the larger fabric of the place. Some are quickly filling up with construction that most resembles the worst of 20th century American urban renewal, and of course they are all filled to the brim with cars. At a time when beautiful and humanely designed cities may represent some hope for the future, these places look pretty hopeless. Instead of writing breathlessly about how the starchitects are ‘innovating’ by creating architecture that does nothing to add to the common well being of a place, Ouroussoff should be talking about the basics in urbanism, reminding city designers, leaders, and developers to remember what, in the end, makes any city a great city. The street, the block. This is the place to start building the new. First, last and always, great places, great cities, begin with great public domains, and in particular with their streets. We all own the street: it is the place where we all belong, where we can move and linger, where we can erect monuments to tell our stories, where we can sit and watch our neighbors, or sit and sip and read the news of the day. 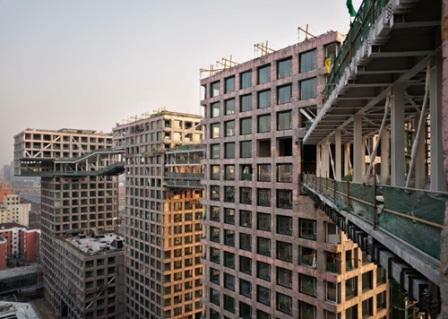 Steven Holl’s city streets, 20 stories above, in Beijing. Image from flickr. Whether in grids, as in so many American cities, or in meandering knots of non-linear pathways, all cities must begin with their public realms, their streets. 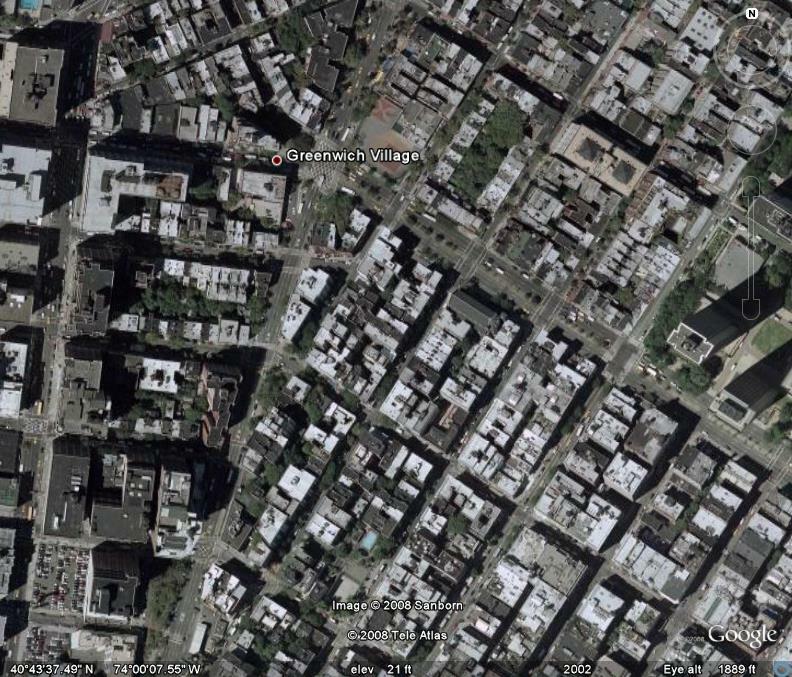 Streets make blocks, and blocks are where buildings go. Simple. In the 1950s and 1960s we experimented with what was then called the superblock, and especially in the planning and construction of subsidized housing. Now that we have thankfully torn most of this down, we can say we’ve learned a lesson – streets at the fine grained scale of small blocks make the best cities. Steven Holl’s ‘Linked Hybrid’ project, and so many other new developments in Beijing and elsewhere, are, sadly, superblock designs. 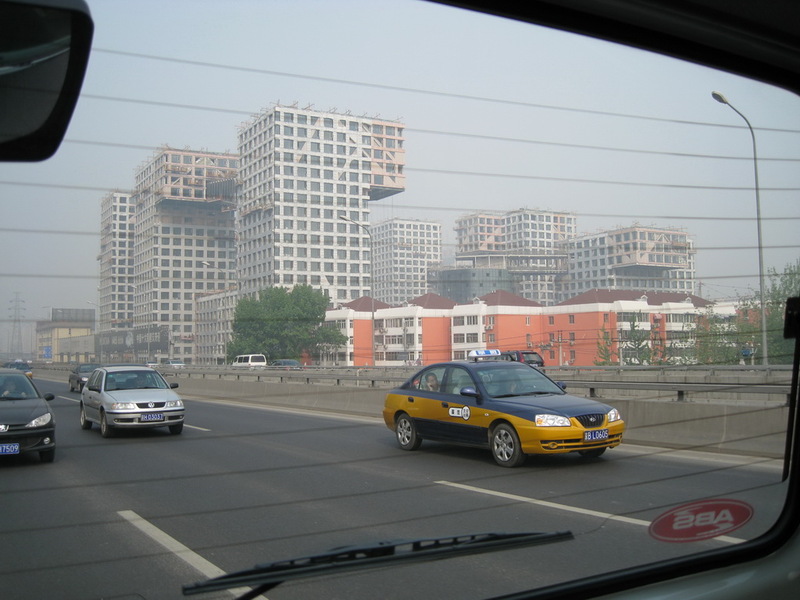 And this, in Beijing, which has a fascinating pattern of layers of streets and blocks. In the central city, there is a grid of major streets that is very large – say 2,500 feet wide (east to west) and well over 3,000 feet long north to south. Then, interior to this large block is a fine grain of minor streets and passageways, with most streets running east and west, and passages, or even narrower streets, running north and south. This secondary, and finer, layer of streets breaks the city into manageable, walkable blocks. 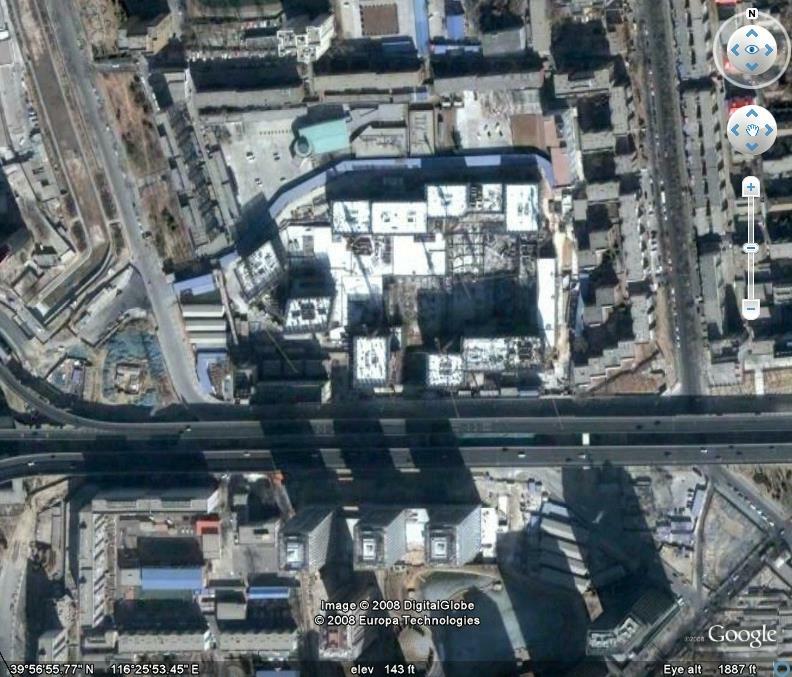 Go to Google Earth and take a look at Beijing. The damage is everywhere in evidence – huge superblock developments are the pattern of choice for almost all that’s new. 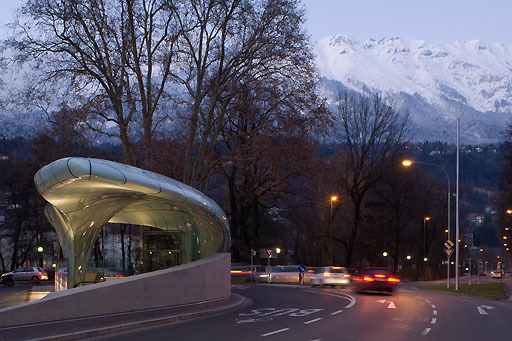 But the starting points of a fine grained urbanism – the street, the block – are still there to act as inspiration. Seems to me like a good place to start.